picture is his daughter Sarala. What about "demographic balance" for Sinhalese? Who appoints the Vice Chancellor? Amidst heavy lobbying by several key ministers to get the top UNESCO post for Sri Lanka's nominee Professor Senaka Bandaranayake, the Sri Lanka National Commission for UNESCO has also begun campaigning. So far ministers have visited more than 30 countries in different continents in a campaign that is known to be costing millions. A spokesperson for the Sri Lanka National Commission for UNESCO told The Sunday Times that they had been sending letters to other National Commissions of the 186 member countries, seeking support for Prof. Bandaranayake. The Sunday Times learns that President Chandrika Kumaratunga has spoken to French President Jacques Chirac, regarding the appointment. Lakshman Jayakody visited Haiti, Honduras, Barbados, St. Lucia, Argentina, Brazil, Uruguay, Bolivia, Columbia and Canada from March 14 to April 4. Mangala Samaraweera visited Kenya, Uganda, Tanzania, Zimbabwe, Lesotho, South Africa, Mauritius from February 27 to April 10. Lakshman Kiriella visited Senagal, Coted'Ivoire, Kenya, Togo, Gabon and Ghana from April 15 - 30. Vishwa Warnapala visited Czech Republic, Hungary, Lituania, Slovakia, Uzbekistan, and Kazakhstan. Minister and SLFP Vice President Mahinda Rajapakse in a critical letter to President Kumaratunga has urged her to pave the way for a democratic process within the PA where decisions would be taken on consensus before they are transformed into policies. In a letter dated April 19 Mr. Rajapakse has analysed the cause of the loss of credibility and the lack of confidence by the voters in all political parties, which includes the PA as well. He has called upon the President to hold a serious and frank discussion in the true democratic tradition, which will enable them to think freely and without bias about the performance of the government so far. "In the campaign for provincial power, none of the mainstream political parties including the PA ever focused on real provincial issues that the people are concerned with," he has said. "No one, including us, none ever had development programmes for individual provinces. There are many issues that could have been addressed to with the presently devolved power that includes education, health, public transport and highways. These provincial issues and programmes for provincial development should have been the thrust of the provincial campaigns. "Unfortunately, all political parties ignoring this provincial aspect of the elections, raised national issues with the government and the UNP fighting it out," he said. Mr. Rajapakse adds that this image fighting gave the JVP an opportunity to project itself as a remotely possible third force and at the provincial level for individual candidates. It was therefore a battle for preferences sans politics. "The rejected votes which had risen to over 334,000 is even higher than the votes polled by the JVP which is 248,000 and is a matter to be taken serious note of." He queries why over 334,000 voters who carried 1,002,000 preferences decided to reject votes. It could be that they have lost confidence in the electoral system and they do not consider any political party worth their vote. Mr. Rajapakse states in his letter, that after all these years in power at the centre and in the Western Province, they have failed to capture the minority vote, which is a significant block in Colombo. The majority of the Muslim vote is with the UNP now. This is so in almost all provinces even where the SLMC fielded its own candidates. He also states that it was quite evident from the voting pattern in the Central Province, that the allegiance of the plantation workers has shifted from the CWC. This challenge to the authority of the traditional CWC leadership should be considered in the context of Mr. Thondaman holding a Cabinet portfolio in the PA government. The PC elections indicated that they have lost the majority of the traditional anti-UNP vote to the JVP and in Colombo to the MEP, he has said. A very important factor highlighted in the letter are the increasing prices of essential commodities, fuel and energy which added to the disaffection of the voters. Pave the way for a very democratic process within the PA where all policy decisions would be on consensus before they are transformed into policies of the government; to take immediate effective measures under the President's personal responsibility to win back the social forces who were with them and are moving away; to give very high priority at national level to the cost of living, public transport, health, food, security, agriculture and employment generation in rural projects. On the eve of the Sri Lankan team's departure for the defence of the World Cup, star batsman Sanath Jayasuriya has been granted a divorce from his wife Sumudhu Karunanayake by the additional District Judge of Colombo. Mr. Jayasuriya filed the divorce action against his wife of less than one year after what was described as the wedding of the decade attended by President Chandrika Kumaratunga, Opposition leader Ranil Wickremesinghe and a host of VIPs. Ms. Karunanayake was also allowed to keep the jewellery worth Rs. one million gifted by Mr. Jayasuriya. The Additional District Judge, Geraldine Ganlath, gave the order after Mr. Jaysuriya agreed to pay a massive Rs. four million as permanent alimony. Celebrating Independence is serious business and Sri Lanka has also spent a small fortune on arrangements to celebrate fifty years of independence last year, according to figures given in parliament recently. In addition to an extravagant refurbishing exercise of government buildings, more than ten million rupees have been spent on decorations, security and temporary constructions by the government, according to figures given in answer to a question raised in parliament. Accordingly, the government has spent a mammoth Rs.. 3,396,313 on temporary stalls and a flag post in Kandy and another Rs. 2,846,396 on temporary constructions. Similarly, it is learned that decorations cost another Rs. 842,562 and special decorations in the capital city and at the outer gate of the Parliamentary Complex in Kotte cost Rs. 543,330. Expenditure on the three services and military exhibition floats have cost the government Rs. 8,127,485 and on police personnel Rs. 2,871,032. The funeral of Prithi Kodagoda, senior journalist and Senior Manager (Communications) of the Public Enterprises Reform Commission took place yesterday at Mt. Lavinia. Ms. Kodagoda who began her journalistic career at the Sun/Weekend group later served on the Daily News Editorial from 1985 to 1994. She specialised in business and economic news. She then joined the Colombo office of Reuters. After joining the Public Enterprises Reform Commission she took up the post of senior manager (communications) and served there, until her premature death on Friday. After considering several top names but failing to come to a consensus, the SLFP leadership has fallen back on a safe bet — outgoing Chief Minister Mahinda Yapa Abeywardene — as its top candidate for the upcoming polls in the south, party sources said. They said an inner cabinet team comprising President Kumaratunga and ministers Richard Pathirane, Mangala Samaraweera, Amarasiri Dodangoda and Mahinda Rajapakse had reviewed options and finally agreed on Mr. Abeywardene. Among the chief ministerial candidates considered were Minister Rajapakse, Deputy Minister Mahinda Wijeskera, Mulberry Group frontliner Dallas Alahapperuma and Chamal Rajapakse. According to these sources, the President's first choice was Mr. Rajapakse but he has declined, mainly on the basis that it might give the signal that he had been sidelined from national politics. Mr. Rajapakse is also known to have reservations about how the provincial system works and what he sees as the ineffectiveness of the Southern Development Authority. They said Minister Pathirana had objected to the job being given to Mr. Wijesekera while Minister Mangala Samaraweera shot down Dallas Alahapperuma, saying he lacks popular support now and was not a good team man. Other SLFP sources have described Mr. Alahapperuma as a 'myth' created by the media and a force behind the proposal for a PA-UNP coalition. The row between the Sri Lankan Embassy in Kuwait and the Sri Lankan Cultural Association there came to a climax, when the President and the Secretary of the association were arrested by the Kuwait police. Association President Gamini Wijeratne, Secretary M.S.Iqbal and three committee members were arrested at the embassy premises on a complaint made by charge d' affaires of the embassy. The 15-year-old association, that organises the popular Sri Lankan Festival in April, has become a voice of the 125,000 strong Sri Lankan community in Kuwait. The dispute erupted with the official visit of Labour Minister John Seneviratne to Kuwait in February. According to Mr. Wijeratne, some of the committee members of the association were critical about the behaviour of some embassy officials and had made complaints to the minister. Sri Lanka embassy in Kuwait has been without an ambassador for some time and is run by Charge d' Affaires Ranjith Gunaratne. There are more than 500 'run-away house- maids' taking refuge in the old embassy building next to the new four- storey Sri Lanka embassy house. However the six-member Sri Lankan media team which visited Kuwait during the festival days, were denied entry into the building to meet or talk to the housemaids in distress. Surprisingly, the Sri Lankan President Chandrika Kumaratunga was too denied entry to the Sri Lanka embassy premises in Kuwait under the cover of "not enough security", when she was on an official visit to the Gulf, one embassy official said. According to the sources, the plight of the maids in distress is rather bad and there are allegations that some embassy officials are ill-treating them. Even the embassy officials admitted there are only six toilets for more than 500 people. According to latest reports, the officials of the association were released after questioning. They said they had already lodged official complaints with the Foreign Ministry and other authorities in Colombo. The Health Ministry's Medical Supplies Division which is facing massive debt and storage problems has cut down on allowances and overtime payments for its storekeepers from January this year, an official said. He said the storekeepers were now refusing to do overtime and go on outstation work till their payments were restored. In addition, there was also a shortage of storekeepers with vacancies not being filled for several months. The Medical Supplies Division recently ran into crisis when the State Pharmaceuticals Corporation refused to supply any more drugs to it until a debt of Rs. 1000 million was settled. The MSD says the debt arose as a result of district hospitals not paying for the drugs supplied to them through the MSD. Officials also say the MSD is facing serious storage problems with drugs being stacked under staircases and oxygen cylinders dumped in the back-yard. This was attributed partly to bureaucratic delays in identifying and destroying outdated drugs. The Sri Lanka Federation of Commuters' Associations has urged commuters to send in their complaints against private bus operators to the federation. The General Secretary S.M Chandrasena stated that they had found that most private bus employees abuse their passengers. Complaints will be received by the General Secretary, Federation of Sri Lanka Commuters' Associations, Central Bus Stand Office, Pettah, Colombo 12. Colombo city will still be the centre of May Day rallies and processions on Saturday, though the UNP has moved to Galle apparently for an election-oriented rally and the MEP to Gampaha. The ruling PA which earlier planned to have its May Day rally in Matara has now decided to shift to its normal venue — the Town Hall with the procession starting from Campbell Park. Surprisingly, the JVP which has the south as its sronghold is also sticking to Colombo for May Day with the procession starting from the Cooray Park in Wellawatte to the rally at the BRC ground at Havelock Park. JVP Spokesperson Wimal Weerawansa said foreign delegates from Europe and Japan would attend the party rally where the main themes would be the threat posed by privatisation and anti-democratic forces. MEP leader Dinesh Gunewardene said the party decided to move to Gampaha this year because the district had a large working class population. Last year the party held its rally in Horana in keeping with a party decision to go out to the people. The New Left Front with its theme denouncing war and privatisation will hold its rally at De Mel Park with its leader Dr. Wickremabahu Karunaratne now having a new status as member of the Western Provincial Council. Thousands of telephones have gone out of order due to the heavy rains from Tuesday and may take more than a week to be repaired, an official said. More than 8,000 Sri Lanka Telecom phones have been affected island wide, with 6,000 of them being in the Colombo metro area, SLT Customer Services Officer M.L.C. Alwis said. He said that the number affected was unusually large and the SLT would need at least 10 days to repair all. He said some 180 SLT repair teams had been deployed in addition to about 50 private contractors who were helping in the repair work. A large number of telephone lines of private telephone companies were also affected. Lanka Bell General Manager Sunil Lakshmanasinghe said hundreds of lines were affected and repairs were under way. M.L.C. Alwis said. They have deployed 15 teams to repair the phones, and hoped to have everything in order within days. Several internet users complained that while their telephones were in working order they were unable to access the internet or send out e-mail. 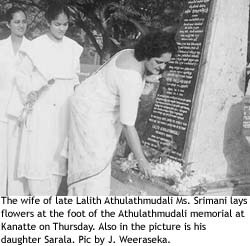 The wife of late Lalith Athulathmudali Ms Srimani lays flowers at the foot of the Athulathmudali memorial at Kanatte on Thursday. Also in the picture is his daugher Sarala. Pic by J. Weerasekera. The failure to summon several Parliamentary Consultative Committees for months is a breach of MPs' rights and privileges, ULF Parliamentarian Ravi Karunanayake has said in a letter to the Speaker. Mr. Karunanayake says he decided to write to the Seaker after many of his oral questions went unanswered in Parliament and he was unable to raise these matters in the respective committees as they had not met for some time. According to Parliamentary sources, the consultative committee on finance has not met for some 13 months while committees on ports, telecommunications, environment and forestry and public enterprises have also not met for six months. Similarly, the consultative committees on foreign affairs and defence have not met for five months while that on education has not been summoned for two months. Mr. Karunanayake told The Sunday Times it certainly was time to protest as there was no forum for MPs to raise queries of public importance. This amounted to an infringement of the collective rights of MPs to raise queries and the citizens' right to have them so raised.